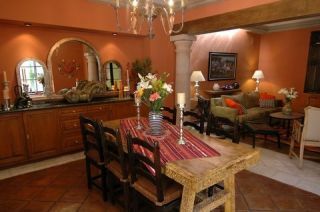 This charming Mexico vacation home is located on one of the most photographed streets in Mexico and is only a short flat walk to the Jardin, the heartbeat and center of San Miguel de Allende. There are over 50 wonderful restaurants to enjoy within a few blocks. 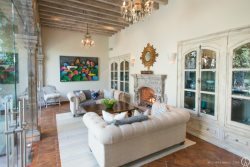 A total renovation was completed in February 2009, bringing in all the modern conveniences of home while enjoying the charm of Old Colonial Mexico. There are 3 beautifully decorated bedrooms, each with a private bath and lots of outdoor living space to enjoy the fabulous weather in San Miguel de Allende, Mexico. As you walk in the front door you are greeted by a warm entry with fabulous Mexican folk art, a fabulous fountain with a beautifully landscaped main patio. A main living area with comfortable furnishings is a great place to gather and rest after a busy day. This room has a large flat screen television with cable that includes U.S. channels and a DVD player. The modern, fully-equipped kitchen has stainless steel appliances, including a dishwasher, microwave and garbage disposal. Enjoy dining in the formal dining room or on the outdoor terrace. While the house is designed to sleep 6, it is equipped to entertain more for dinner or small parties. There is one bedroom located on the main level. This is “The Zebra Room.” This bedroom has a king size bed that can be made up as twins if necessary. It also has lots of storage and a small desk area. The Zebra Room has a gas heater for chilly mornings. The bathroom has a shower and a bathtub. All of the bathrooms are equipped with electric heaters. Upstairs there are 2 bedrooms. The “Plum Room” is located closer to the front and has a large private terrace. With beautifully landscaping and comfortable chaise lounges, this is definitely a place to hang out during the day or night. You will not believe the views of the Parroquia from here! So close . ..This bedroom has a king bed that can be made up as twins, a large walk-in closet and a gas fireplace for chilly mornings. The bathroom also has a fabulous shower. The other bedroom on this level, “The Green Room” is on the back of the property with a nice view of the large tree at Posada Corazon. This bedroom has a queen bed and well equipped desk for those that need to get in a little work while on vacation. There is a a television with DVD player in this room for relaxing with a good movie. Good storage as well in this bedroom. The bathroom is nice with great views from the shower. Best shower in San Miguel! Between the two bedrooms on the second level, there is another fabulous outdoor terrace with a wet bar with refrigerator and coffee maker. A great place for morning coffee or afternoon gatherings. A fully equipped laundry room is also on the 2nd level where Berta, the wonderful maid that works 5 ½ days a week, does magic with the laundry. A rooftop terrace is the crowning jewel of Casa Carolina del Sur! Overlooking the lush greenery of Posada Corazon, and within throwing distance of the Parroquia, this is a great place to enjoy the many fireworks displays that are popular in San Miguel. There are comfortable chaise lounges for relaxing, as well as a table for dining and drinks. There is street parking on Aldama and there are also several secure parking lots nearby if you have your car in San Miguel de Allende. Staff: Berta is a jewel and sees to the overall daily operation of the house. She is a delightful person and works 5 days a week. You will enjoy getting to know her. She does not speak English but still communicates well. Francisco is the gardener who comes 3 days a week to water the plants and help maintain the outdoor terraces. He speaks a little English and is delightful.